A friend decided that he wanted a Chinese buffet for lunch. Buffets aren't really a thing in this area like they are in Florida. 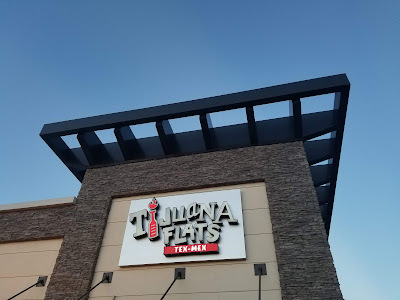 The only one that was listed nearby was called Jumbo Buffet. It turned out to be a standard Chinese takeout storefront with a buffet table in the middle of the restaurant. It didn't look very appetizing to me, so I ordered fresh food off the menu. 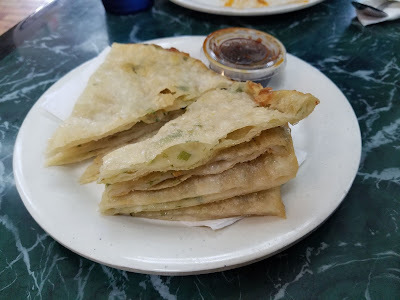 I started with a scallion pancake appetizer, mostly because these are hard to find back home. 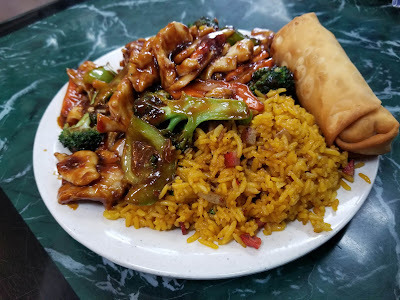 I had the Hunan Chicken combo for the dinner. Served with fried rice and an egg roll. 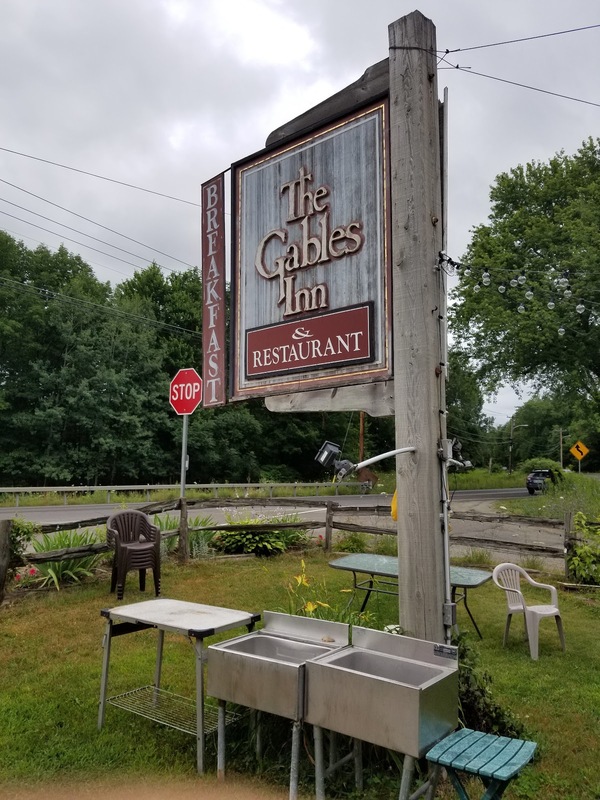 Moving on to Vermont, my first meal was breakfast in Stowe. The place I stayed overnight recommended The Gables Inn for breakfast, which was another hotel down the road. It was basically someone's house where they added a few rooms behind their home and served breakfast on their porch. I ordered the Vermont Breakfast. 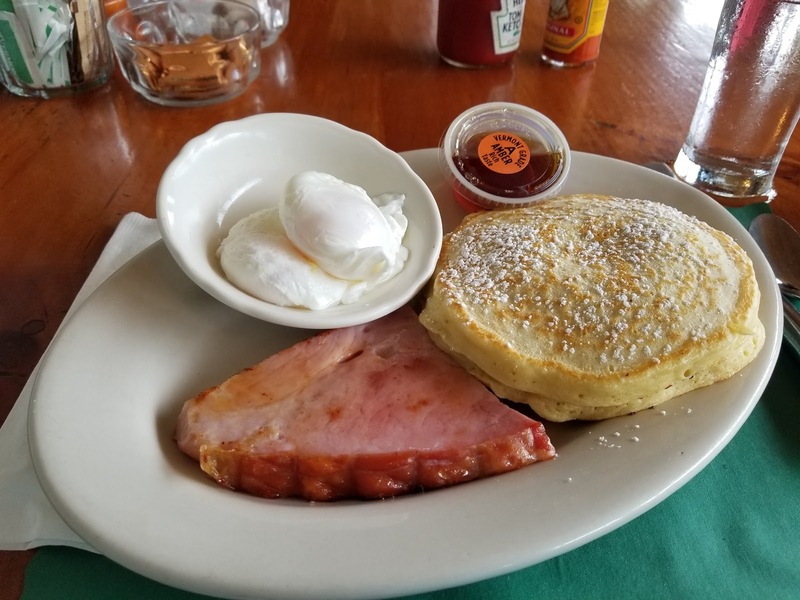 This came with pancakes, local maple syrup, a slice of ham, and two poached eggs. 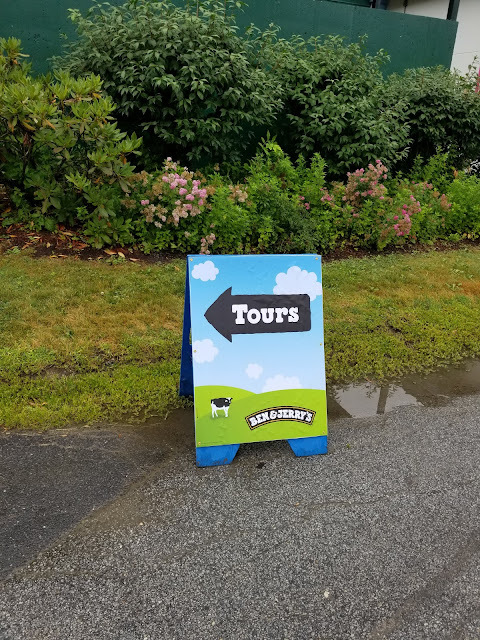 Up next for food in Vermont was the Ben & Jerry's Factory Tour. Pretty nifty tour, although no pictures were allowed of the actual factory floor. 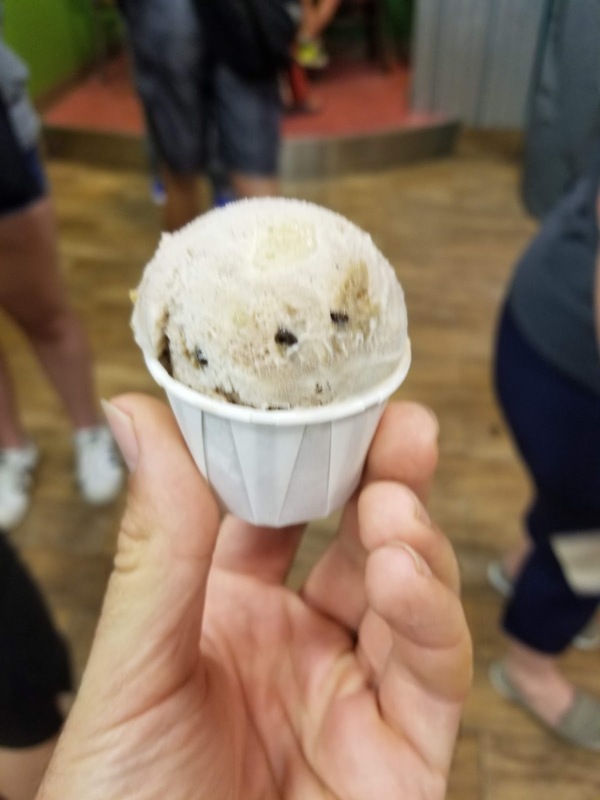 Here's the sample of ice cream they gave at the end of the tour. I tried the Black Garlic Tonkotsu Ramen here. It was noodles, pork, mushrooms, scallions, bamboo shoots, with a soft boiled egg in a pork based broth. It was a pretty substantial bowl of ramen. 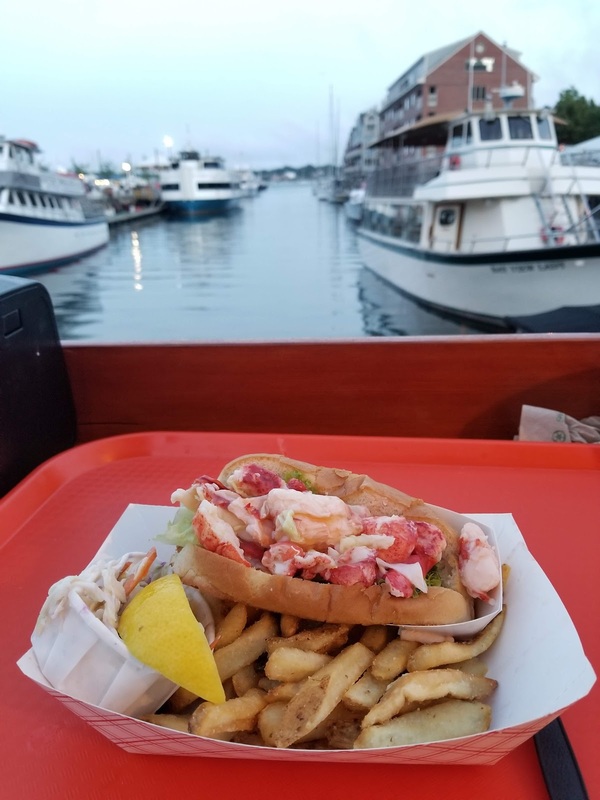 My one and only meal ever in New Hampshire. 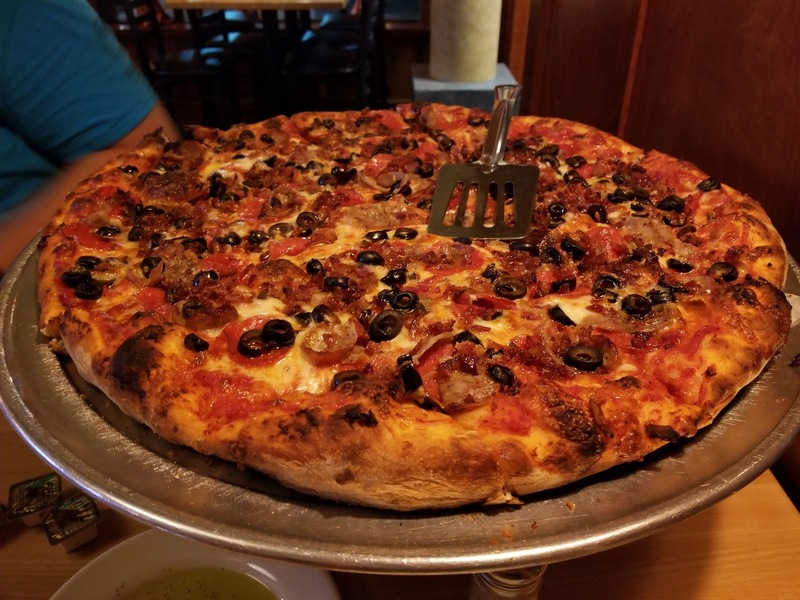 I stopped in Conway for lunch and ended up at Boston Brothers Pizzeria. 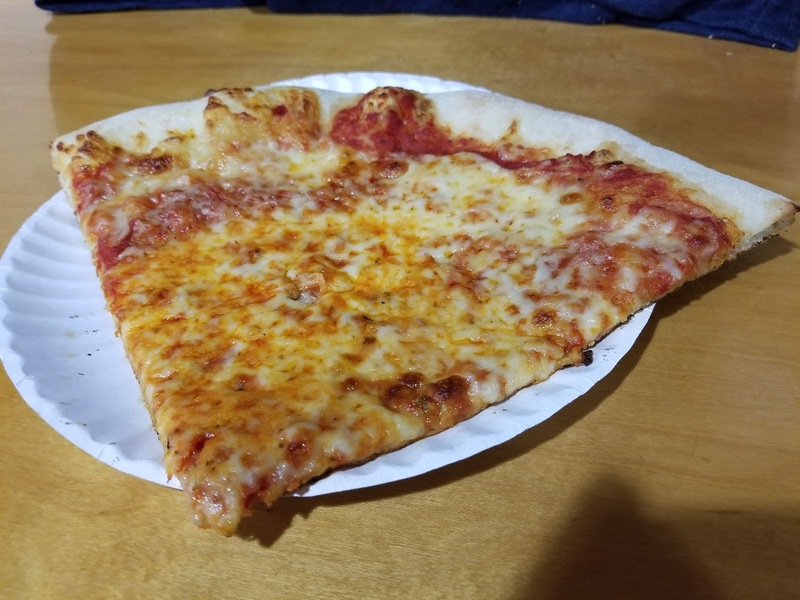 The cheese slice was large and affordable. My initial choice was one of their specialty pizzas, which they were out of. 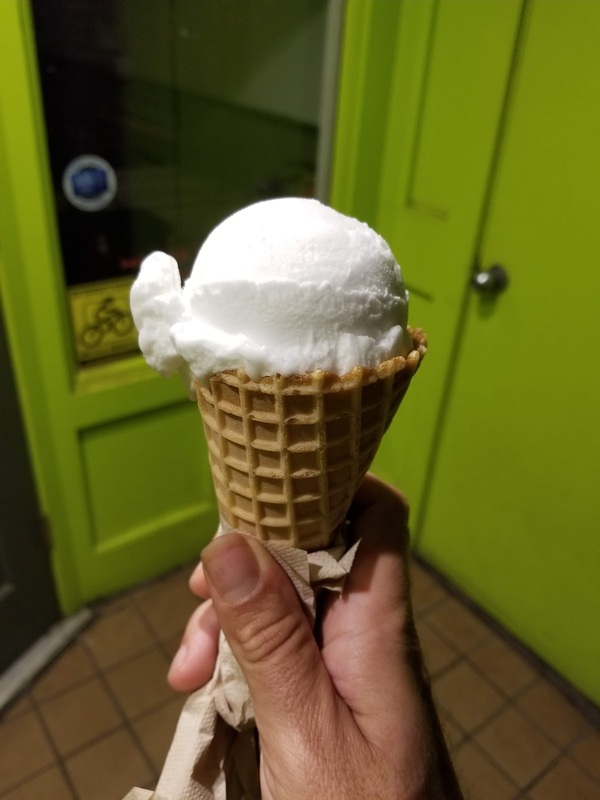 Got some lemon gelato in a waffle cone from a place called Gorgeous Gelato. Moving on to Rhode Island. My tour of states I hadn't been to was running short on time, so my only adventure in this state was stopping in Providence for dinner. This city looked like it had seen better days and most restaurants were closed, but I did find a place open called Tom's BaoBao. I started with a pork bao. They also had hand pulled noodles. 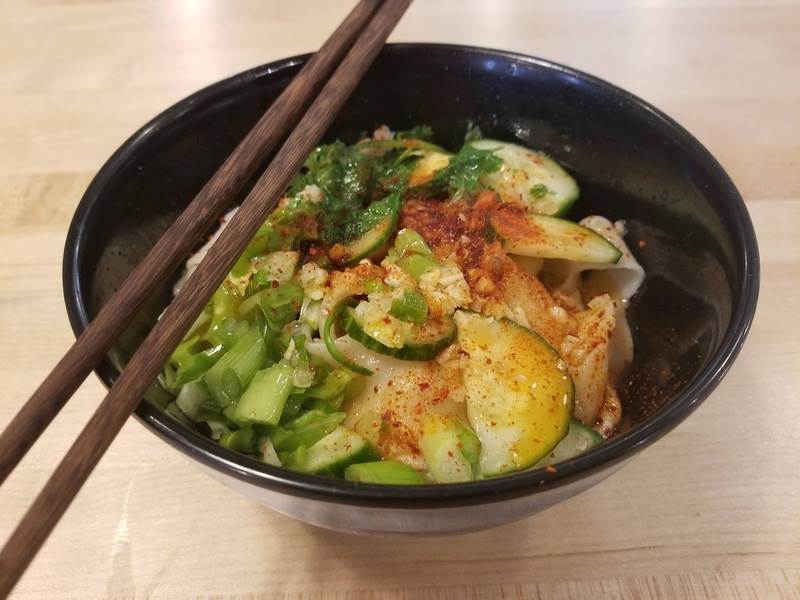 Topped with cucumber slices, scallions, and chili powder. 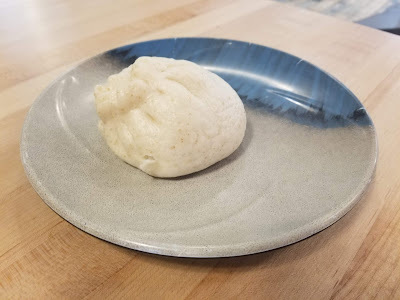 The noodles were really good and shadowed the bao. 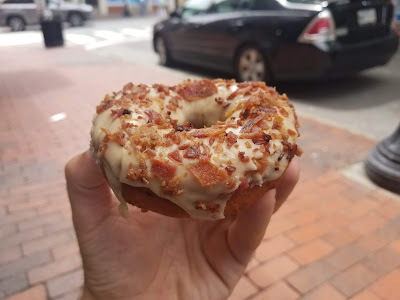 And that's my food tour of Connecticut, Vermont, New Hampshire, Maine, and Rhode Island. It was a tasty food adventure! They had huge pies for reasonable prices. Their medium pie fed three people with leftovers. Their biggest pie could have probably fed ten people. I ate here twice. On my first visit I split a pie topped with pepperoni, sausage, bacon, and black olives. The pizza wasn't NY style, served in square slices with a medium thickness crust. 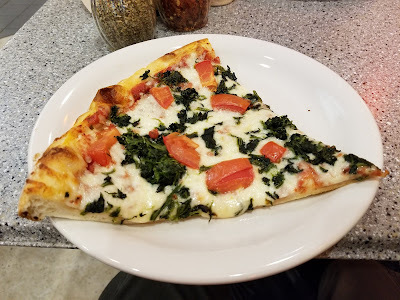 The crust, cheese, sauce, and toppings were well proportioned and I was very pleased with the pizza. 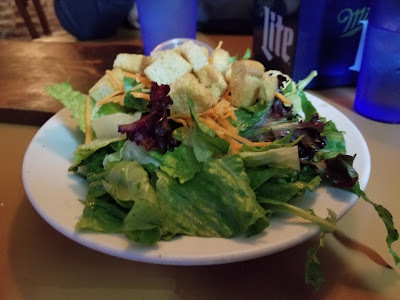 On my second visit I started with a side salad. Exactly what I expected. 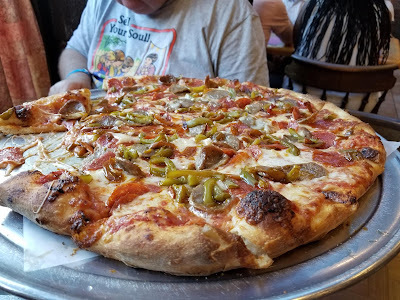 We ordered a pizza topped with pepperoni, sausage, and bell peppers on this visit. I don't know if it was a different cook, but this pie was disappointing. It was messy looking, had a bit of a cheese overload compared to the rest of the pie, and didn't hold itself together worst of all. Even after it cooled, the pie kept on falling apart. So 50% good pizza depending on who's making it? 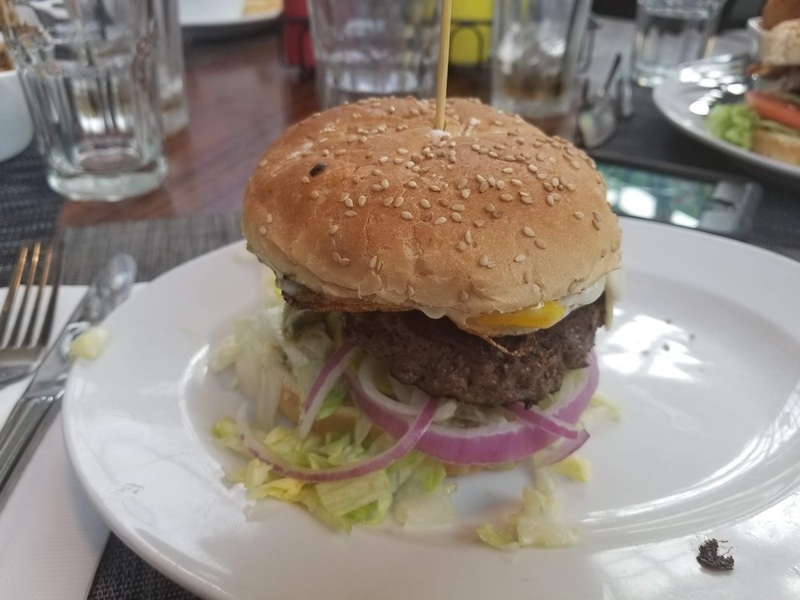 I had a build your own burger, topped with an egg, guacamole, onions, lettuce, and pickles. Can't say I was impressed. Toppings were very inconsistently spread (guacamole only made it to a quarter of the burger) and came served with much of the lettuce on the plate. I ordered Cheddar Tater Tots as my side which were initially forgotten, then were lukewarm when finally delivered to the table. 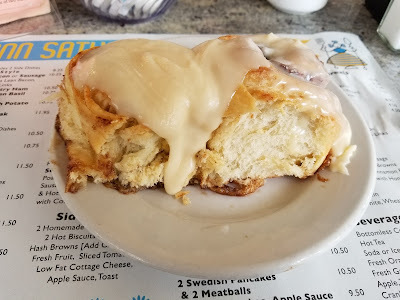 Some restaurants I ate at during this trip had multiple visits. Luxe Burger Bar did not earn that honor. This was a coffee shop across from my hotel. 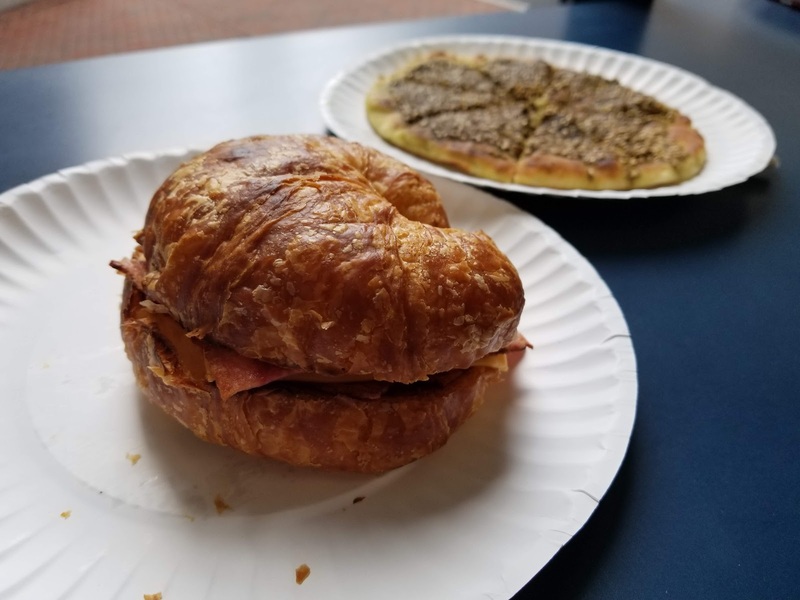 Came here for breakfast one morning and had a bacon, egg, and cheese croissant. I also noticed they served Lahmajoun (I believe - I initially learned this food as Turkish Pizza). 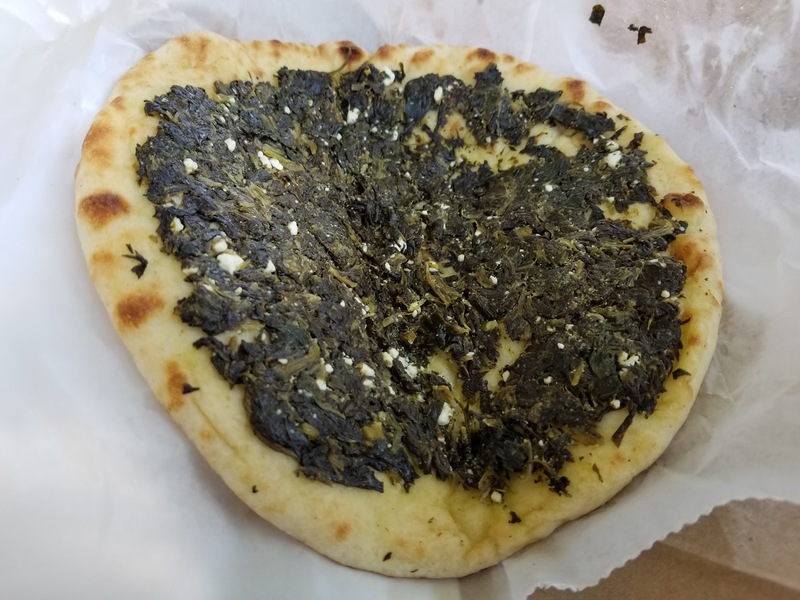 I ordered one of those as well topped with sesame paste. Came back and had spinach and feta another day. The sesame was better. I had the Lebanese Stew. Big chunks of lamb, beans, and other veggies were cooked until tender in a tomato based broth. 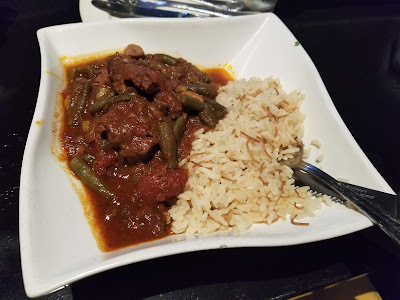 The stew was served with rice. It was delicious. A little on the expensive side, but still delicious. This was another restaurant I visited twice. 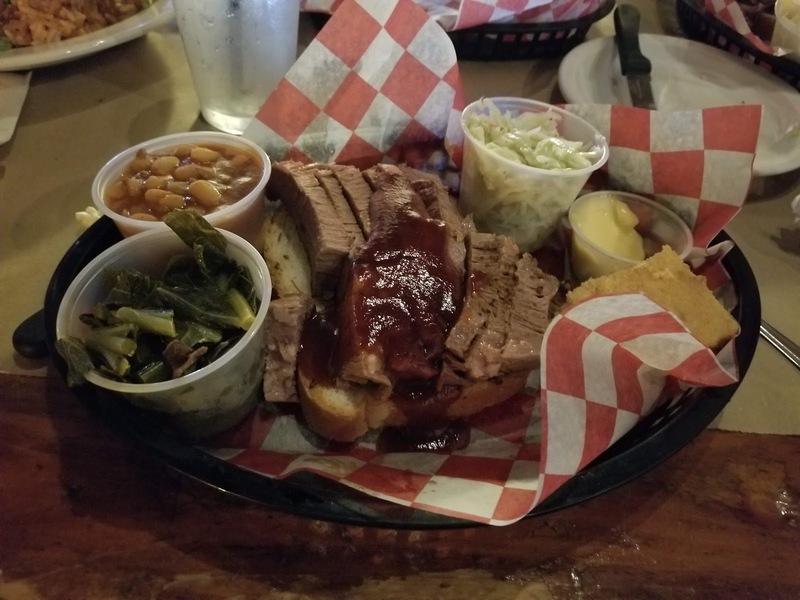 I had the brisket on my first meal here. The brisket was served over a slice of bread, topped with barbecue sauce. Beans, collards, coleslaw, and cornbread was served as sides. I had the Texas Sausage on my second visit, served with the same sides. This was a fast food Korean restaurant. 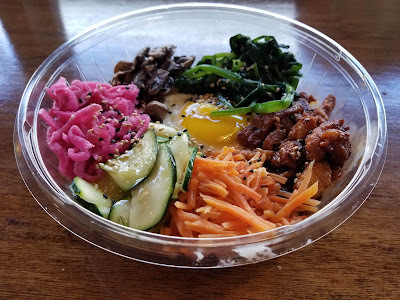 I had the Bibimbop. This rice bowl was topped with an egg, spicy pork, and various vegetables. It was a good portion, affordable, and delicious. 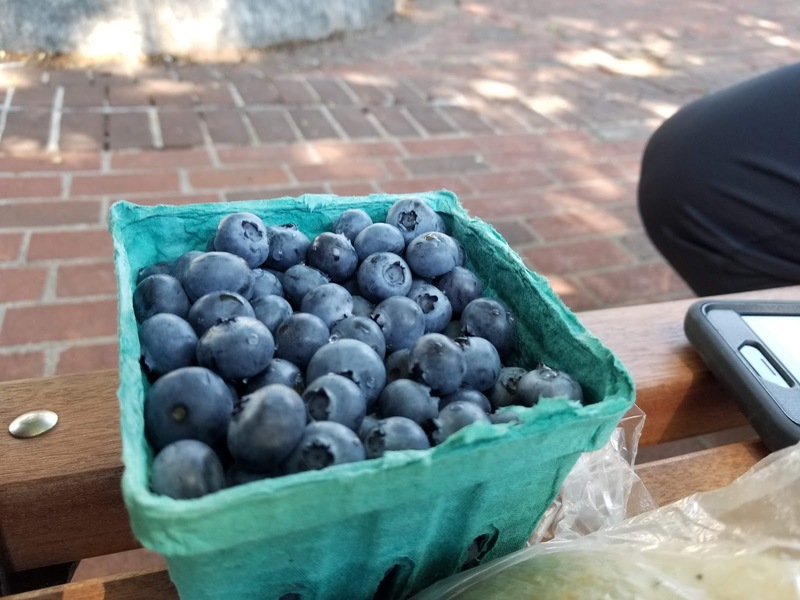 This was a small Friday morning farmers market. I bought a loaf of bread and blueberries. This was a German restaurant that looks like it's been around forever in a good way. 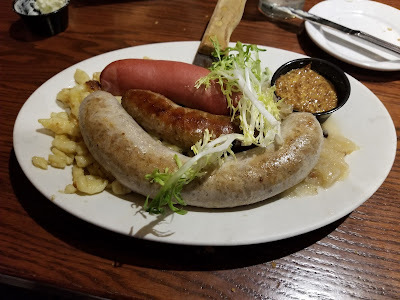 I had the Wurstplatte, which came with a bratwurst, knackwurst, and a boar & cranberry sausage. The sausages were served over spatzle and sauerkraut. Of the three sausages, the boar & cranberry was the highlight. This concludes my visit to Springfield. My overall impression was that the city has seen better days and seems to be in transition right now (MGM Casino is taking over several blocks of downtown). While the food options were a bit slim, there definitely were some highlight restaurants! 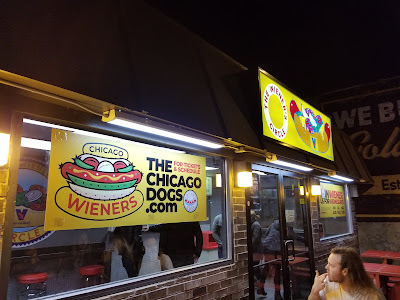 I recently went on a trip to visit Chicago. 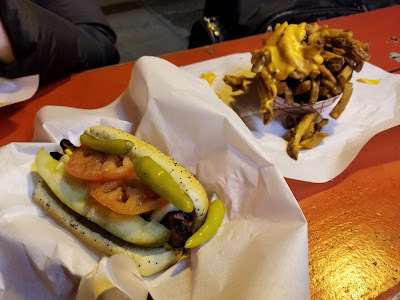 I had never been to the city and while there I tasted some of Chicago's food. Apparently Chicago is known for their barbecue. I wasn't aware of this before visiting the city, but smoked meat was added to the list of Chicago foods to try. I ended up at a restaurant called Twin Anchors. They have been open since 1932 and boast that Frank Sinatra was one of their regular customers. I ordered a half slab of ribs with a side of onion rings and cole-slaw. The ribs were good enough. I found the meat to be a little on the dry side. Not the best I've ever had but good enough to keep the restaurant open since the 1930s. This restaurant was recommended as one of the best places to get Chicago-style pizza in the city. I'm still a bit confused on the different nomenclature of Chicago-style pizza, and the explanation that I got here didn't help. There is apparently pan pizza, deep dish pizza, and stuffed pizza. I think I understand that stuffed pizza is what Giordano's serves (seems like nobody in Chicago actually likes Giordano's). Haven't really figured out the difference between pan and deep dish though, and I don't know which version of the pizza I ate here. Started out with a side salad. The pizza, topped with Italian sausage and spinach. I enjoyed this pie. 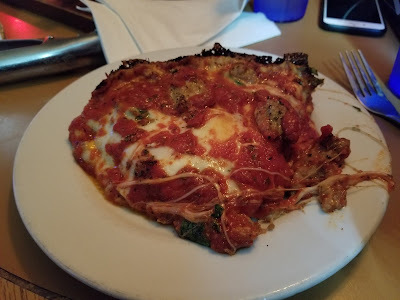 It wasn't the complete overload of cheese like you get a Giordano's and was much better proportioned. I did really enjoy the crust which got nice and crispy around the outer, vertical edge of the pie. This was a Swedish diner, which was a new concept to me. I visited them for breakfast and ordered one of the specials, which was a Swedish breakfast sampler. 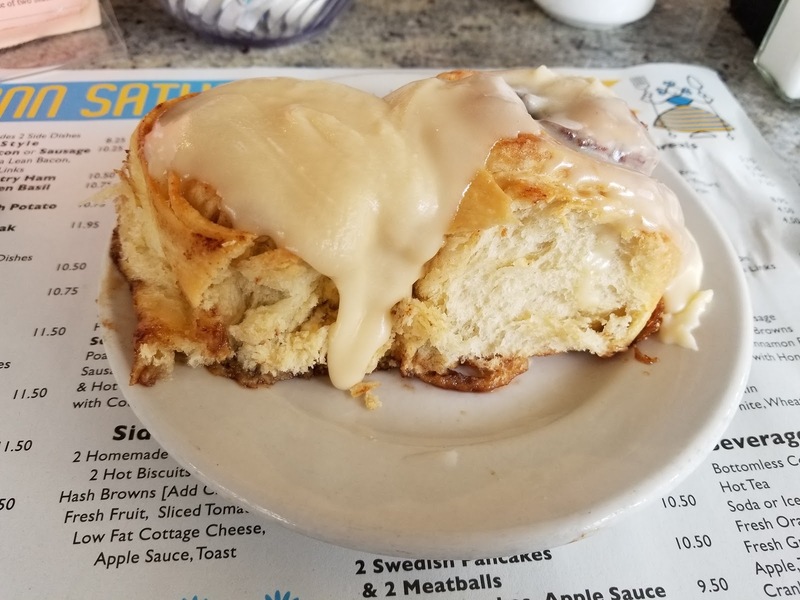 It started with two very large cinnamon rolls. I was pretty much full after both of these. 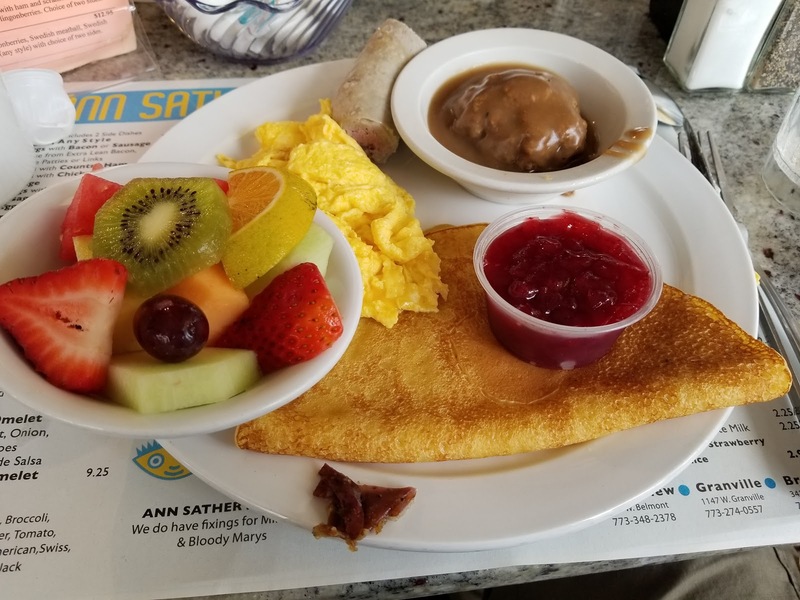 This was followed with a plate filled with a Swedish pancake with lingonberry jam, a Swedish meatball with gravy, a Swedish sausage, scrambled eggs, and a fruit salad. 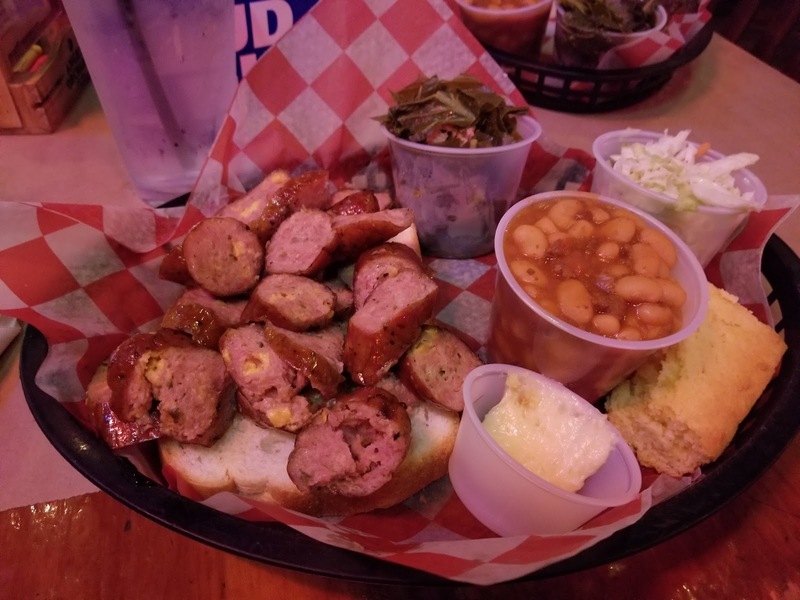 I liked it all with the exception of the sausage. 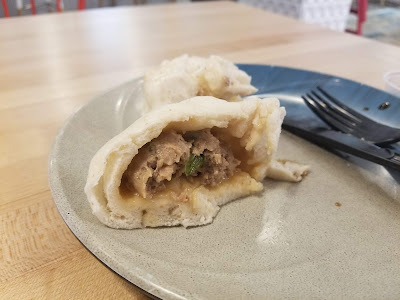 I believe it was a pork and potato sausage that lacked flavor. 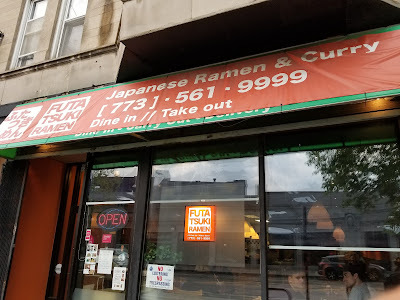 A friend in Chicago said the ramen in this restaurant is amazing. He was right. Futatsuki was a very efficient restaurant with only a few things on the menu. There was tonkotsu ramen, curry pork, and some appetizers. The large bowl of ramen had a milky white broth with was delicious. From what I understand, the broth takes a while to cook, getting its color from pork fat and bone marrow slowly seeping into the soup. 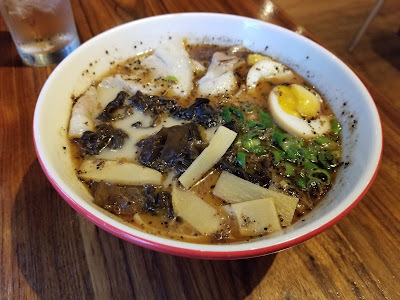 Ramen noodles were hidden underneath the broth. Two slices of pork, scallions, pickled vegetables, an egg, and nori finished off the bowl. 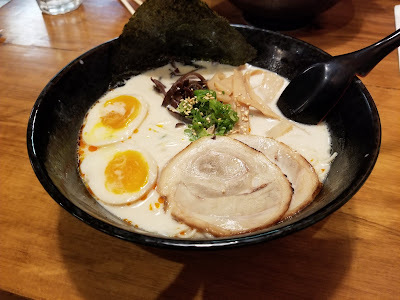 I don't like making bold statements when it comes to food, but this just might be some of the best ramen I've ever had! 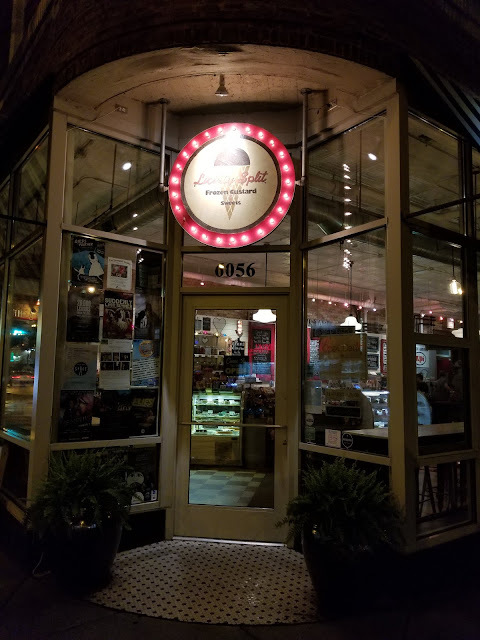 Frozen custard, desserts, and candies was what Lickety Split sold. I had the Bing Crosberry Concrete. 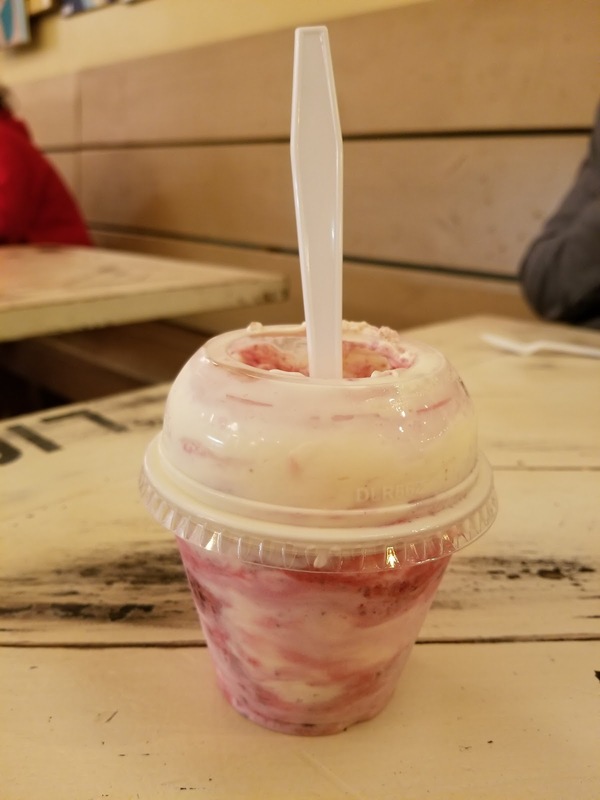 This was cherries and raspberries mixed together with cheesecake, graham cracker crust, and vanilla custard. It was tasty, but I thought it was a bit on the expensive side for the small size of the cup which it was served in. Had Thai food in Downtown Chicago here. Wonton and BBQ Pork soup. The menu made this sound more exiting in my head then it was. This was basically a huge bowl of wonton soup that you can find in any Chinese restaurant. The hot dog was very adequate. The toppings were on in the right form, unlike my previous experience with a Chicago dog. 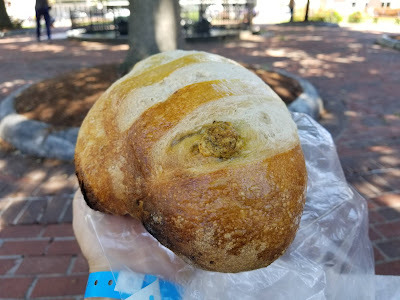 The bun had poppy seeds on it. 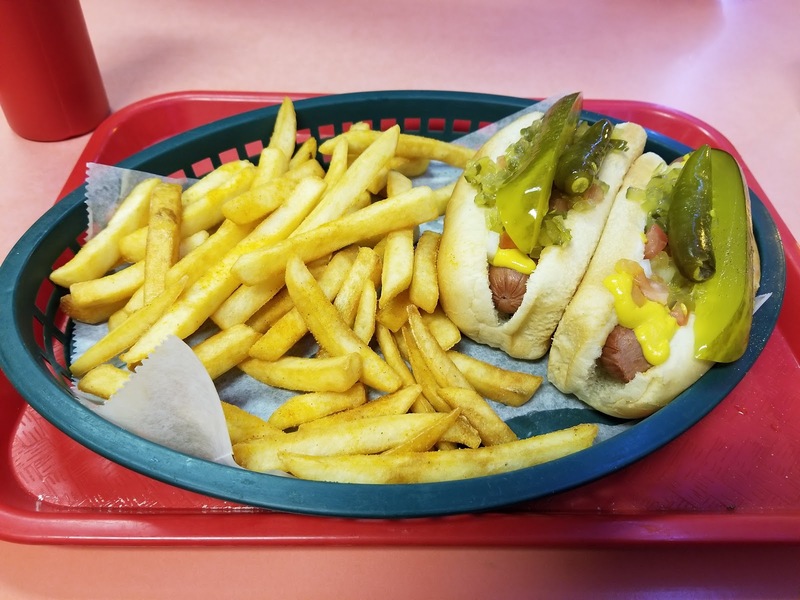 I've had better Chicago style dogs with more generous toppings in Florida. 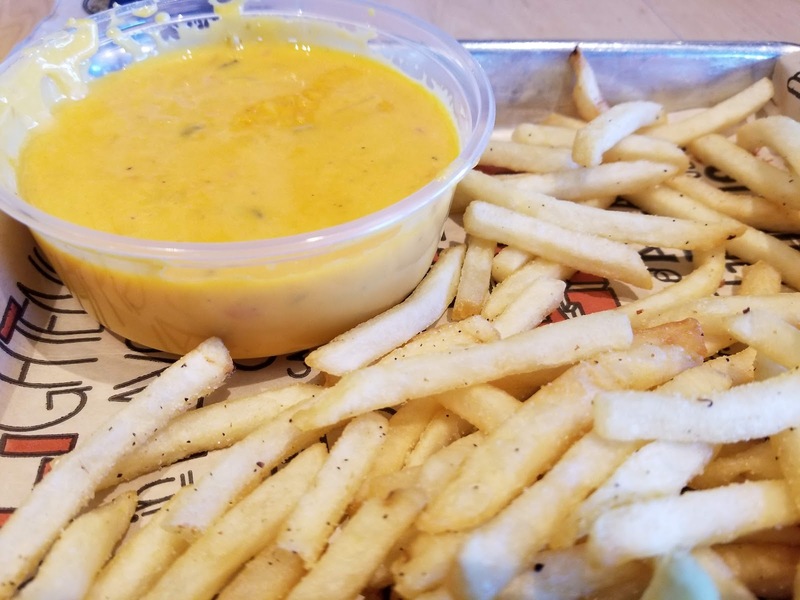 We won't mention the cheese fries. 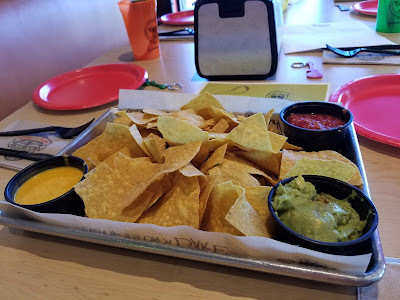 They were cold and soggy topped with something that didn't really resemble cheese besides color. The majority of these were thrown out. Got a quick slice of pizza for a snack from this restaurant near the Willis Tower. I decided to try a NY style slice in Chicago. In my head, it was what I would expect NY style pizza to be like in the midwest. Way too much cheese and a bit doughy. 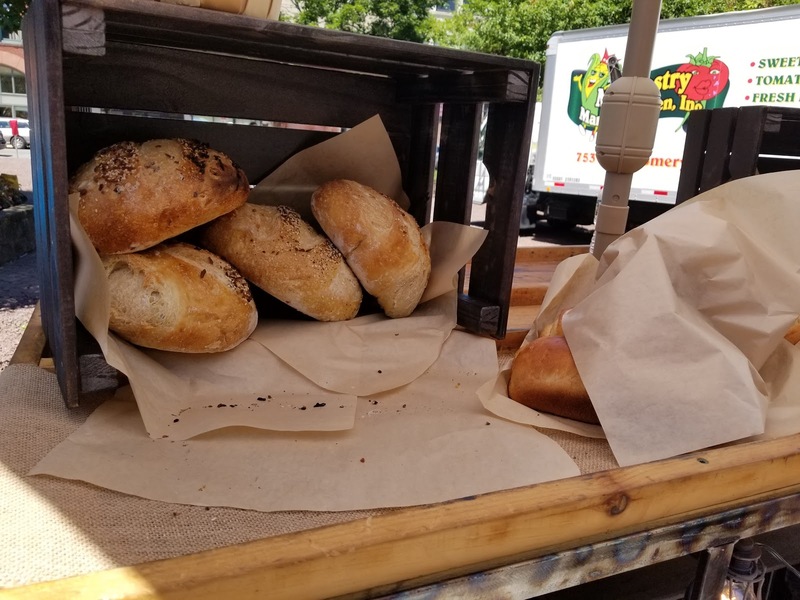 I visited a food hall in Chicago called the French Market. After wandering around a bit, I decided to try a booth called Pierogi Crib. I had a Pierogi Bowl. 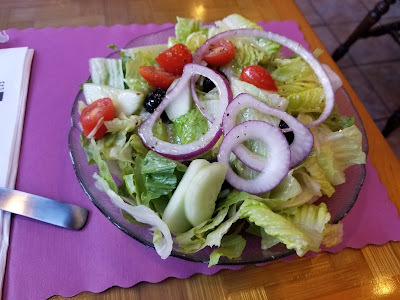 This was an assortment of six pierogi served over a spinach salad, topped with bacon, grilled onions, red cabbage, and sour cream. I very much enjoyed this meal. Tijuana Flats invited me to one of their Orlando locations to sample some of their new menu items, specifically the new Cheeseburger Tacos and fries. Tortilla chips, salsa, guacamole, and queso are always on the menu at Tijuana Flats. 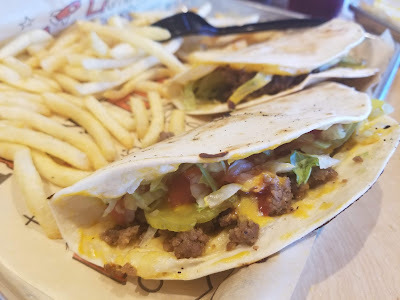 The Cheeseburger Taco was a tortilla filled with ground beef, cheese, lettuce, tomatoes plus pickles, ketchup and mustard. You get two tacos with seasoned fries for $7.89. The Cheeseburger Tacos and fries are available at Tijuana Flats through the end of August. Go try them while you can!